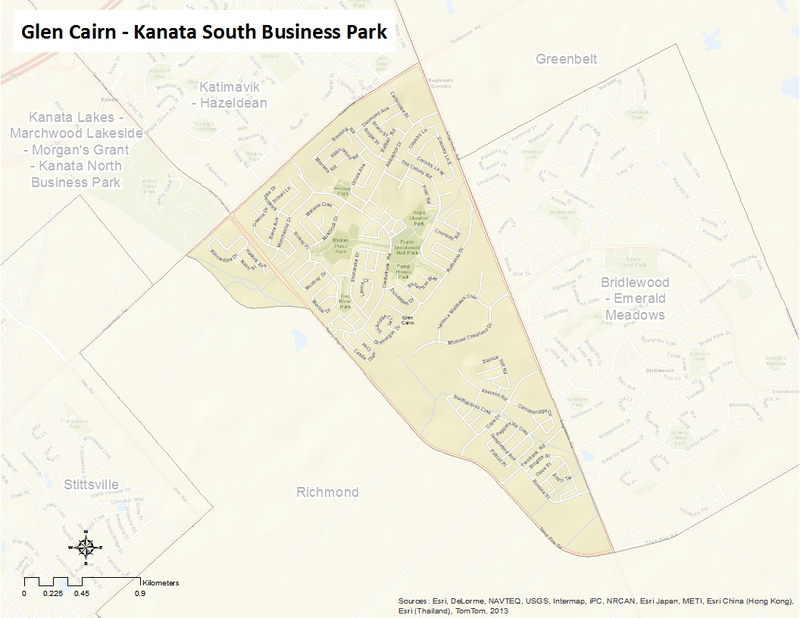 The Glen Cairn-Kanata South area is bounded by Hazeldean Road to the north, Fernbank Road to the south, Eagleson Road on the east, and is between Iber Road and Terry Fox Drive to the west. It includes the community of Glen Cairn and Kanata South Business Park. Here is an infographic that describes the neighbourhood as a Village of 100 (2011 data). One of Kanata’s three original urbanizing communities dating back to the 1960s, the neighbourhood is a testament to the work of Bill Connelly, Graham Ball and others. Originally settled as early as 1818, the community of Orange Hill was renamed ‘Hazeldean’ in 1858, reminiscent of the fact that many inhabitants hailed from the land of heather, Scotland. ‘Glen Cairn’ was inaugurated in 1963 as part “Canada’s Centennial City” which promised to be home to 10,000 residents by 1967. Glen Cairn’s relatively isolated location beyond the Greenbelt first attracted buyers who were drawn to the country setting; then brought residents together in a common desire to build a sense of community. Today, residents enjoy the luxury of having schools, parks, shopping, churches, parks, recreational and community facilities within walking distance of their homes. This vibrant and people-friendly community has an Association: see the Glen Cairn Community Association.